i Click 'view all' to instantly compare this good deal with offers on other top wireless keyboards. Qwerkywriter S Typewriter Inspired Retro Wired & Wireless Keyboard is currently selling at $259.99, approximately $0.03 higher than average. With a lowest price of $257.99 and an average of $259.96 it is selling on the high end of its usual range. Price volatility is 0.59% (meaning it does not change often), so the price should stay low for a while. Right now this product is a recommended 'good deal'. 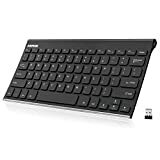 Compare the current price, savings (in dollars & percent) and Buy Ratings for the top Wireless Keyboards that are closely related to Qwerkywriter S Typewriter Inspired Retro Wired & Wireless Keyboard. Here is how Qwerkywriter S Typewriter Inspired Retro Wired & Wireless Keyboard compares with other leading Wireless Keyboards. FeaturesQWERKYWRITER s is the original typewriter inspired mechanical keyboard.New wired USB mode with nkro and multi Device wireless connectivity!Dual scroll knob encoders and Cherry mx Blue mechanical switches!Integrated tablet stand up to 12 inches and a Macro programmable return bar!